“Rarely do managers focus on the quality of the fishtank & what surrounds the fish: they mostly notice individual fish and become fixated on them. But if the water is toxic, the fish suffer. If there is no movement in the water, it will be deprived of life-giving oxygen. Wise owners do not blame the fish for their poor appearance or performance. They do not take the fish out from time to time to give them a spot of training, tell them to smarten up & look more lively, and then plop them back in the same dirty water. Instead they clean the tank”. In my experience of unlocking systemic intelligence – through the particular lens of systemic coaching and constellations – leaders and change agents respond readily (and often with wry laughter) to William Tate’s excellent metaphor about culture, and our persistent bias towards individualism. In this article, I want to suggest that there can be a similar tendency to think about intangibles such as purpose in the same way. In other words, wise owners and leaders do not just create a shiny compelling purpose and retrofit it to their business, and plop it back into the same dirty water, expecting that all will be well. The possible dangers of doing this – with some interesting corporate examples – are set out in a recent HBR article by Graham Kenny, Your Corporate Purpose Will Ring Hollow If The Companys Actions Don’t Back It Up. The visual lens of systemic constellations reveals in a graphic way that purpose has a unique potential to create an energetic wellspring – and “magnetise” people to pull in the same direction – but this can only happen in a supportive culture and environment. Truly purpose-led organisations are healthy living systems, with a good flow of value, exchange and a vitality in their people and culture. In this article, I want to show how the systemic approach can diagnose misalignments, generate insights, and above all – through its particular understanding of underpinning “ordering forces” – create the conditions in which the true potential of purpose can thrive. From the perspective of the systemic constellating tradition, purpose is inherent to systems and not just constructed. True purpose therefore needs to be discovered and articulated rather than simply invented. It is the first and deepest ‘order’ in organisations, and – with its constituent principles – answers the essential question of what an organisation’s place and function is in the world. In particular, the founding purpose needs to be respected, but also continually evolved to meet the changing needs of the marketplace & society. In a previous article, we showed how the systemic mapping method – together with robust dialogue – can create a powerful leadership practice for attuning to, and discovering a ‘true and potent’ evolutionary purpose [go here]. 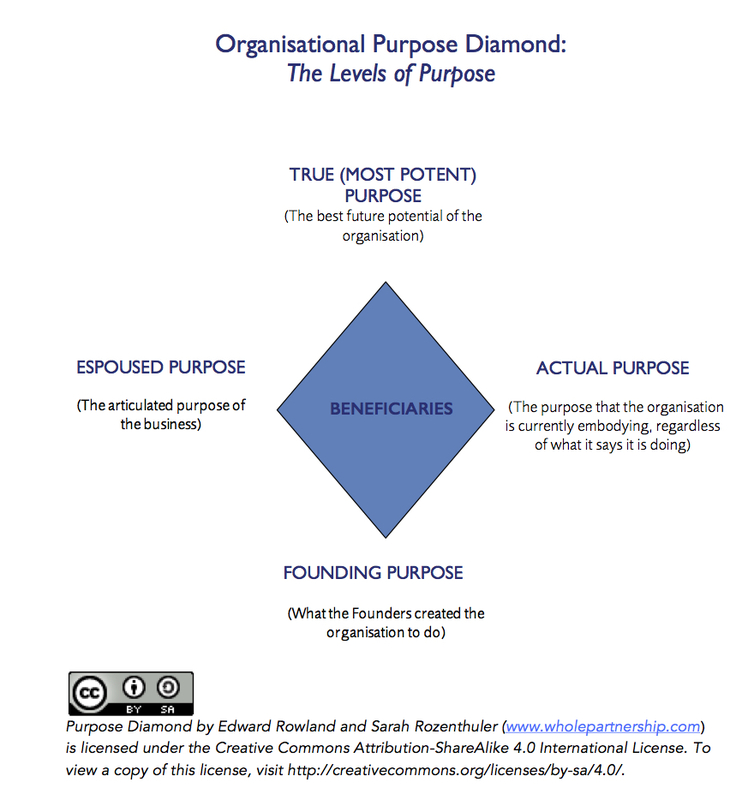 We also offered an original tool, the Purpose Diamond, that can be used as part of this process. “We have all worked within or supported organisations where overlooking the Founding purpose created dysfunction, or where working to an Actual purpose different to the Espoused purpose was challenging for staff at all levels – like living a lie. The beauty of the Whole Partnership approach is that mapping these distinct purposes enables the truth and honesty of what is in the way to show up without blame. Through the mapping, the true, most potent purpose has space to be known and seen”. Using a fuller client story as an example, we also suggested that to go further and crystallise the most ‘potent purpose’ that works for all stakeholders, it is essential to ‘see the whole’ and navigate the wider systemic context as part of the discovery process. Often invisible, these orders can be difficult to attend to. They have a deep effect on purpose when misaligned. Negative manifestations include employees suddenly leaving, power struggles, massive drops in sales and performance, or a purpose (or strategy) that seems fabulously compelling but that has little impact. When these forces – which are co-emergent with purpose – are well attended to, however, they can powerfully orientate a system to its true purpose. Such attunement can help resolve deep-seated issues by re-patterning the relationships between key systemic elements, and thereby enable a better flow of leadership and purposeful action across the whole ecosystem of stakeholders. Using them as a lens, we can help identify where crucial systemic issues relating to purpose – and the points of highest leverage – are located. 1. Belonging. Everyone in the system has a right to belong, including and especially the founders of the organisation. Of course, belonging is dependent on performance and more time-limited (than in families, for instance). However, it is important to ensure that all participants are acknowledged for their roles and contributions, and that any dismissal is done as transparently and respectfully as possible. Entanglements can emerge when prior (or current) participants are excluded from overt institutional memory or when their contributions are ignored or belittled. Sometimes the purpose itself is directly caught up in these entanglements and identifications, while in others the “exclusions” (subtle or otherwise) can have a profound but indirect impact on the purpose of a system. For instance, in several family businesses we have worked with, the role of a woman founder – and wife to the (male) leader/founder – has been insufficiently recognised. In all cases, acknowledging that these businesses were set up as a family business – with the contribution and investment of the woman founder – not only settled the people and stakeholders but unlocked the energy of the purpose itself and its capacity to attract customers. 2. Place. Priority goes to those with greater responsibility for the whole. This means that leaders need to acknowledge and “own” their authority, and carry the responsibilities that are theirs. With specific regard to purpose, this means the leaders “holding”, and taking responsibility for, the purpose. If they do not, what we see time and time again – using a systemic lens – is that others will be recruited by the system to carry it on their behalf. For instance, in one client system we mapped, the Founding CEO of a global leadership development consultancy was so absent that the MD of the local office – in the country where the consultancy was originally founded – was pulled into a ‘vortex’ in the centre of the system, to carry the ownership of purpose that the CEO had neglected. (This recognition deeply moved the MD as it was at great personal cost, as well as cost to the energy of the system). In numerous other client systems, including a large electricity company and a business school, we have seen management consultants stepping in to carry the ownership of purpose that the leadership team has ignored; this can be a necessary transition but is not a sustainable solution. 3. Exchange. There needs to be a balance of giving and taking. Resources and rewards need to be made available in ways that engender trust and perceived fairness. Exchange is rarely of precisely equivalent things, especially over relatively short periods of time. Inherently, people give what they have and seek to receive what they need. But it’s essential to assure that each participant is contributing value, and also receiving things they need (e.g. money, respect or development). Inevitable imbalances need to be acknowledged. This may sound far-fetched to some, but using a systemic lens we see that significant imbalances around exchange may have a profound effect on the purpose of a system as well as its people. For instance, in a finance business we mapped, the current (espoused) purpose was full of an acquisitive energy: although there was a potent energy, the purpose wanted to take rather than serve (which naturally had a rather off-putting impact on the customers). On further investigation, it emerged that this taking energy was a perceived compensation for all that had been given in the formation and leadership of the business. Part of the resolution – enabling a new and ‘true potent purpose’ to take root in the system – was to acknowledge the effort and sacrifices that key players had made. 4. Time. Those who come before have priority over those who come later. Length of service needs to be respected. Often just acknowledging the experience, knowledge and insight that comes from long institutional memory releases entanglements, letting more experienced participants contribute more fully – and newer entrants learn – in surprising ways. This in no way limits change or innovation, rather it allows the new to emerge creatively and resourcefully on the foundations of what has gone before. In the specific context of purpose, often we see that unfinished business with people who have served the business a long time can have a profound impact on the purpose of a system. For instance, in a client family business, the leadership team and ‘true potent purpose’ itself could not turn and face the customers and future until the Founders attended well to the painful exit of long-serving shareholders, and acknowledged their length of service (and contributions). Doing so settled the overall field. 5. Acknowledgement. The basic principle of acknowledging reality or ‘what is’, and not-denying, is in a sense an enabler for the other orders to apply & function. Acknowledgement has two main aspects: first, it not only means a friendly but unflinching truth-telling, including naming of difficult realities and inconvenient facts; second, it means consciously owning those realities in relation to relevant others. In all the client examples described previously, it was not enough for the ‘difficult realities’ to be revealed by the mapping or pointed out by the facilitator. Those realities needed to be named and owned in dialogue by the relevant players in relationship to each other. It is a natural order that when reality is faced in this way, a system – including its purpose – gains in strength. Conversely, when reality is denied, difficult patterns get passed on. Although the acknowledgement process may seem initially awkward or uncomfortable to some, it is ultimately liberating for all. This can require a significant amount of inner development. Our own experience with leaders, as well as supervising change coaches and consultants over the last twelve years, has truly brought home the truth of the Theory U maxim that: “The success of an intervention depends on the interior condition of the intervener”. Using our embodied presence is a critical skill in leading awareness-based systemic change; we learn that knowledge about systems can be accessed not just through the mind but directly in the body, and through our feelings and intuition (‘Whole Self’). This includes raising awareness of how we learned about the ordering forces in our family of origin (as our primary pattern generator). Our expanding awareness then enables us to ‘zoom back’ and take a birds-eye view so that we can see the organisational system as a whole and find our right place within it, free from context overlays from the past (‘Whole System’.) The more we can be grounded in our presence, and avoid becoming entangled in unhelpful dynamics, the more we can learn to become skilled pattern perceivers (and interveners). For leaders and coaches, the more we can raise our inner game, the more we can raise our outer one. In this age of disruption, humanity seems to persist (as Otto Scharmer has put it) in “collectively creating results that nobody wants”. In my experience, albeit on the relatively small scale of working with change leaders within organisations, the ordering forces behind systemic work have a remarkable capacity to be on ‘everyone’s side’ by helping us find ways forward that serve the well-being of the whole system. When mapped in a constellation, it is deeply exhilarating to see a system that is healthily focused on its true purpose and customers, where everyone is the right place – much like watching a top-class orchestra or dance ensemble in full ‘flow’. The energy feels unstoppable, magnetic, and in service of life. The more leaders can develop their systemic intelligence to understand and work with these ordering forces, the more they can ‘clean the tank’ by themselves – removing obstacles and elegantly orienting their teams and organisations around a potent purpose. By integrating this understanding into their ongoing work and conversations, and personal presence, leaders can activate and co-create vibrant and effective organisational cultures. NOTE: I’d like to thank my colleagues Sarah Rozenthuler, Mark Stanley and Gemma Adams for their comments on this article. I welcome your comments and feedback below on what is work-in-progress. I hope you found it useful. Join us for Leading on Purpose, a one-day workshop on purpose-led leadership on 29th November (go here).